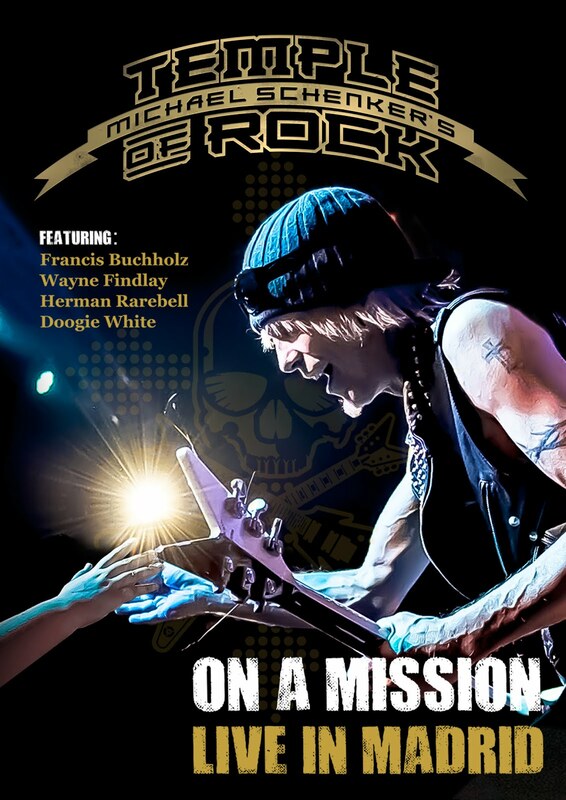 Discussions Magazine Music Blog: MICHAEL SCHENKER: An EXCLUSIVE interview! Schenker’s first claim to fame was joining his older brother Rudolph’s band Scorpions in 1969. He and vocalist Klaus Meine joined the band at the same time, although at fifteen, Michael was the youngest member of Scorpions by a handful of years. He also just happened to be a unique guitarist and gifted songwriter. He honed his skills with Scorpions for four years before leaving the band and joining British rockers UFO. 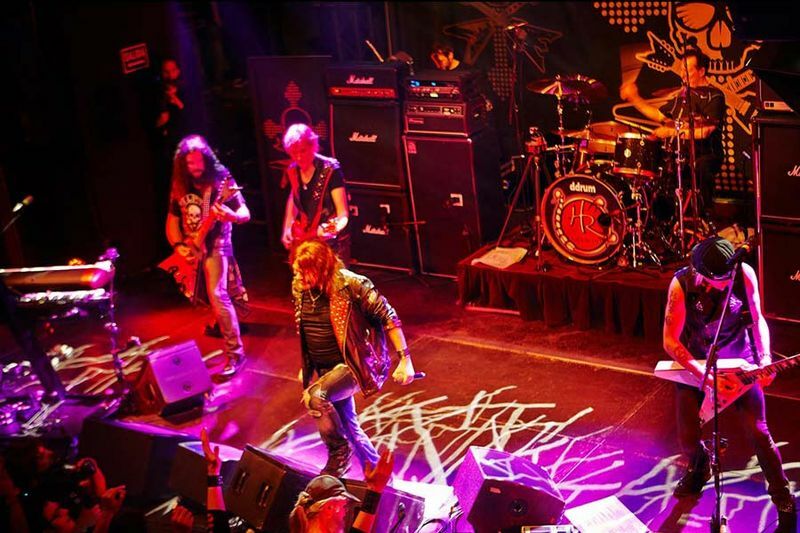 With UFO, Schenker became an international sensation, steering the band away from their early Space Rock leanings towards an edgy Hard Rock sound. UFO became a force to be reckoned with, but by the end of 1978, he left the band. And to think he was barely into his twenties at this point. 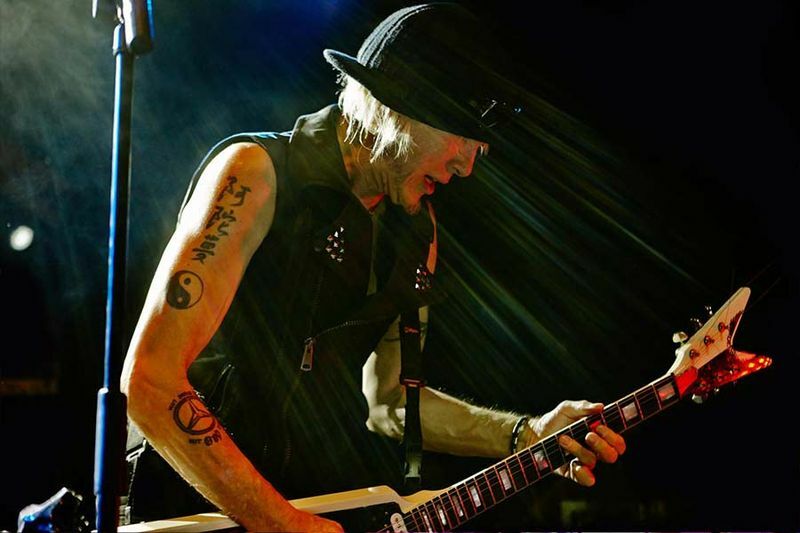 Schenker rejoined Scorpions right after leaving UFO, but soon realized he wanted to focus on his own thing. So he left – again – the following year. 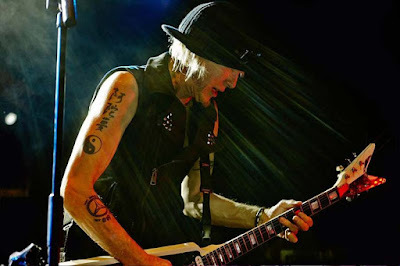 The Michael Schenker Group was his next project, although he moved away from the commercial sounds of his previous bands and embraced his experimental side. 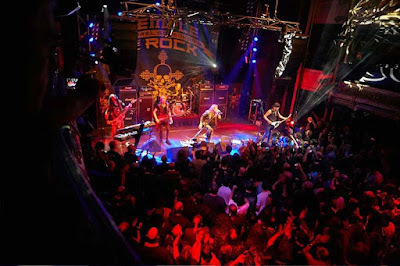 For the next thirty years, he focused on various other projects including a brief reunion with UFO, the McCauley-Schenker Group and other endeavors. By 2008, he was ready to embrace his illustrious Hard Rock past and formed Temple Of Rock. The band has had several line-up changes over the years but the most recent – and best – features Schenker joined by former Scorpions members Herman “ze German” Rarebell (drums) and Francis Bucholz (bass) plus guitarist/keyboardist Wayne Findlay and powerhouse vocalist Doogie White (Tank/La Paz/Rainbow/etc.). While on tour for their excellent 2015 sophomore studio album, Spirit On A Mission, the band was approached about recording their live show using a new technology called 3D Listening. The results can now be heard with the release of On A Mission: Live In Madrid. On this release, you can practically ‘feel’ the atmosphere of the venue even on the normal stereo mix of this recording. There’s even a version of the release that, with the correct audio equipment, will make it seem as if you are there in the audience enjoying Michael and the boys giving it their all on stage. The material during this scorching performance spans Schenker’s entire career including Scorpions, UFO and, of course, Temple Of Rock. STEPHEN SPAZ SCHNEE: What can you tell us about your latest musical project, Michael Schenker’s Temple Of Rock? 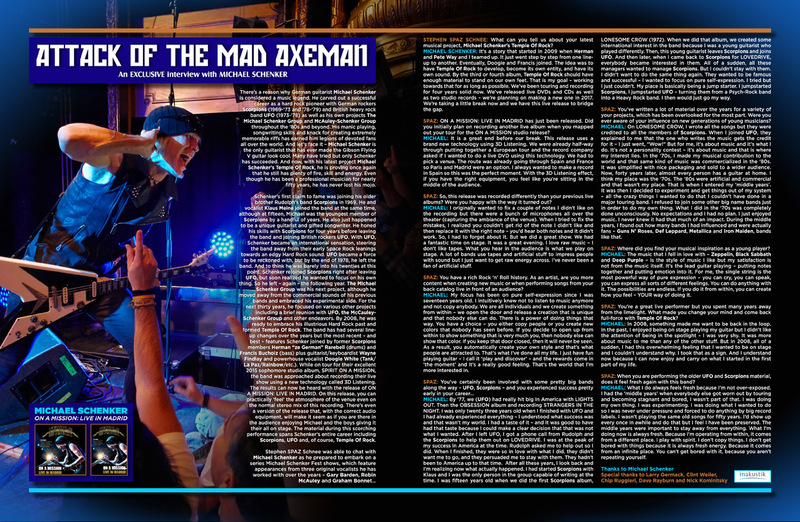 MICHAEL SCHENKER: It’s a story that started in 2009 when Herman and Pete Way and I teamed up. It just went step by step from one line-up to another. Eventually, Doogie and Francis joined. The idea was to have Temple Of Rock to develop, become its own entity, and have its own sound. By the third or fourth album, Temple Of Rock should have enough material to stand on our own feet. That is my goal – working towards that for as long as possible. We’ve been touring and recording for four years solid now. We’ve released live DVDs and CDs as well as two studio records – we’re planning on making a new one in 2017. We’re taking a little break now and we have this live release to bridge the gap. 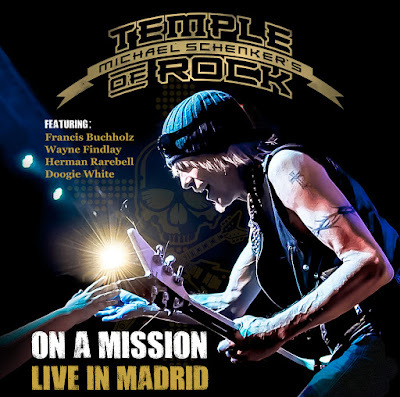 SPAZ: On A Mission: Live In Madrid has just been released. Did you initially plan on recording another live album when you mapped out your tour for the On A Mission studio release? MICHAEL: It is a great end before our break. This release uses a brand new technology using 3D Listening. We were already half-way through putting together a European tour and the record company asked if I wanted to do a live DVD using this technology. We had to pick a venue. The route was already going through Spain and France so Paris and Madrid were an option. I always wanted to make a record in Spain so this was the perfect moment. With the 3D Listening effect, if you have the right equipment, you feel like you’re sitting in the middle of the audience. SPAZ: So, this release was recorded differently than your previous live albums? Were you happy with the way it turned out? MICHAEL: I originally wanted to fix a couple of notes I didn’t like on the recording but there were a bunch of microphones all over the theater (capturing the ambiance of the venue). When I tried to fix the mistakes, I realized you couldn’t get rid of the note I didn’t like and then replace it with the right note – you’d hear both notes and it didn’t work. So, I had to forget about it. But we did a great show. We had a fantastic time on stage. It was a great evening. I love raw music – I don’t like tapes. What you hear in the audience is what we play on stage. A lot of bands use tapes and artificial stuff to impress people with sound but I just want to get raw energy across. I’ve never been a fan of artificial stuff. SPAZ: You have a rich Rock ‘n’ Roll history. As an artist, are you more content when creating new music or when performing songs from your back catalog live in front of an audience? MICHAEL: My focus has been on pure self-expression since I was seventeen years old. I intuitively knew not to listen to music anymore and not copy anybody. We are all individuals and we create something from within – we open the door and release a creation that is unique and that nobody else can do. There is a power of doing things that way. You have a choice – you either copy people or you create new colors that nobody has seen before. If you decide to open up from within to show something that is very much you, then nobody else can show that color. If you keep that door closed, then it will never be seen. As a result, you automatically create your own style and that’s what people are attracted to. That’s what I’ve done all my life. I just have fun playing guitar – I call it ‘play and discover’ – and the rewards come in ‘the moment’ and it’s a really good feeling. That’s the world that I’m more interested in. MICHAEL: By ’77, we (UFO) had really hit big in America with Lights Out. Then the Obsession album and recording Strangers In The Night. I was only twenty three years old when I finished with UFO and I had already experienced everything – I understood what success was and that wasn’t my world. I had a taste of it – and it was good to have had that taste because I could make a clear decision that that was not what I wanted. After I left UFO, I got a phone call from Rudolph and the Scorpions to help them out on Lovedrive. I was at the peak of my success in America at the time. Rudolph asked me to help out so I did. When I finished, they were so in love with what I did, they didn’t want me to go, and they persuaded me to stay with them. They hadn’t been to America up to that time. After all these years, I look back and I’m realizing now what actually happened. I had started Scorpions with Klaus and I was the only person in the group capable of writing at the time. I was fifteen years old when we did the first Scorpions album, Lonesome Crow (1972). When we did that album, we created some international interest in the band because I was a young guitarist who played differently. Then, this young guitarist leaves Scorpions and joins UFO. And then later, when I came back to Scorpions for Lovedrive, everybody became interested in them. All of a sudden, all these managers wanted to manage Scorpions. But I couldn’t stay with them. I didn’t want to do the same thing again. They wanted to be famous and successful – I wanted to focus on pure self-expression. I tried but I just couldn’t. My place is basically being a jump starter. I jumpstarted Scorpions, I jumpstarted UFO – turning them from a Psych-Rock band into a Heavy Rock band. I then would just go my way. SPAZ: You’ve written a lot of material over the years for a variety of your projects, which has been overlooked for the most part. Were you ever aware of your influence on new generations of young musicians? MICHAEL: On Lonesome Crow, I wrote all the songs but they were credited to all the members of Scorpions. When I joined UFO, they explained to me that the one who writes the music gets the credit for it – I just went, “Wow!” But for me, it’s about music and it’s what I do. It’s not a personality contest – it’s about music and that is where my interest lies. In the ‘70s, I made my musical contribution to the world and that same kind of music was commercialized in the ‘80s. It was simplified with nice packaging and sold to a wider audience. Now, forty years later, almost every person has a guitar at home. I think my place was the ‘70s. The ‘80s were artificial and commercial and that wasn’t my place. That is when I entered my ‘middle years’. It was then I decided to experiment and get things out of my system – all the crazy things I wanted to do that I couldn’t have done in a major touring band. I refused to join some other big name bands just in order to do my own thing. What I did in the ‘70s was completely done unconsciously. No expectations and I had no plan. I just enjoyed music. I never knew it had that much of an impact. During the middle years, I found out how many bands I had influenced and were actually fans – Guns N’ Roses, Def Leppard, Metallica and Iron Maiden, bands like that. SPAZ: Where did you find your musical inspiration as a young player? MICHAEL: The music that I fell in love with – Zeppelin, Black Sabbath and Deep Purple – is the style of music I like but my satisfaction is not from the music itself. It’s the lead guitar playing – putting notes together and putting emotion into it. For me, the single string is the most powerful way of pure expression – you can cry, you can speak, you can express all sorts of different feelings. You can do anything with it. The possibilities are endless. If you do it from within, you can create how you feel – YOUR way of doing it. SPAZ: You’re a great live performer but you spent many years away from the limelight. What made you change your mind and come back full-force with Temple Of Rock? MICHAEL: In 2008, something made me want to be back in the loop. In the past, I enjoyed being on stage playing my guitar but I didn’t like the attention of being in the spotlight – I was very shy. It was more about music to me than any of the other stuff. But in 2008, all of a sudden, I had this overwhelming feeling that I wanted to be on stage and I couldn’t understand why. I took that as a sign. And I understand now because I can now enjoy and carry on what I started in the first part of my life. SPAZ: When you are performing the older UFO and Scorpions material, does it feel fresh again with this band? MICHAEL: What I do always feels fresh because I’m not over-exposed. I had the ‘middle years’ when everybody else got worn out by touring and becoming stagnant and bored, I wasn’t part of that. I was doing my own thing. I was experimenting. I was doing what I wanted to do so I was never under pressure and forced to do anything by big record labels. I wasn’t playing the same old songs for fifty years. I’d show up every once in awhile and do that but I feel I have been preserved. The middle years were important to stay away from everything. What I’m doing now is always fresh. Because I’m operating from within, it comes from a different place. I play with spirit. I don’t copy things. I don’t get bored with things because it is always fresh energy. Because it comes from an infinite place. You can’t get bored with it, because you aren’t repeating yourself.